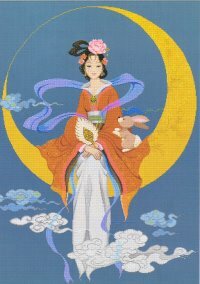 The Story of the Goddess Ch'ang-O: Ch'ang-O, also know as Chang'e or Chang-Ngo, is the Chinese Moon Goddess, celebrated during the Chinese Mid-Autumn Festival on the 15th day of the 8th Lunar month. Sifting through the many legends about how she came to be the lady in the moon, a few details appear consistent from story to story. Ch'ang-O, an immortal, was married to an immortal archer, Hou Yi, who shot down 9 of the 10 suns that had appeared in the sky in order to save the Earth from scorching and the oceans from drying up. The 10 suns were the 10 sons of the Jade Emperor, the Ruler of the Heavens. The Jade Emperor was furious when he realized that Hou Yi had killed 9 of his 10 sons, and as punishment he forced Ch'ang-O and Hou Yi to live mortal lives. Hou Yi somehow procured the Pill of Immortality, or the Elixir of Life in pill form, and hid it in his home before leaving for a while. One day, Ch'ang-O saw a light emanating from the place in which Hou Yi had hidden the pill, and discovered it. As Hou Yi came home, Ch'ang-O popped the pill in her mouth. She became light as a feather and floated up to the Moon, where she lives to this day. She has a hare with her who pounds the remains of the pill in a pestle. In another version of the myth, Ch'ang-O was the sole keeper of the Elixir of Life or Moon Blood (menstrual blood). Her husband, Hou Yi became extremely jealous and quarreled with her. She left her petulant husband and went to live in the moon forever, dispensing her precious Moon Blood to women only. Take that Husband. The Chinese celebrate the Mid-August Festival with moon cakes, round pastry puffs filled with bean paste. These are referred to as delectable by some. In 2003, I traveled with Wood in China for two weeks after spending the summer working in Cambodia, and I had the opportunity to taste the bean filled moon cakes. I have only one thing to say: Bean paste is not delectable by any stretch of the imagination.